which nestles on a south-facing slope, at 1250 m, and is built in a traditional architectural Savoyard style using stone and wood in perfect harmony with natural environment. 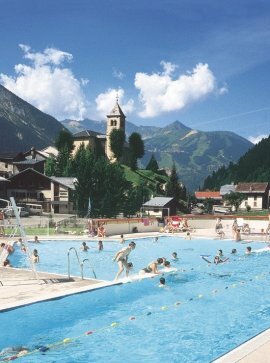 The village, Champagny en Vanoise, offers you the warm contrast of the elegant but rustic village atmosphere with all the modern, essential commercial services available for your convenience. This mountain resort invites you to completely relax. Discover the well-maintained mountain footpaths. From family walks to hikes of several days duration, there are well-signposted footpaths which lead to the mountain passes, mountain huts and the dazzling beauty of the countryside. 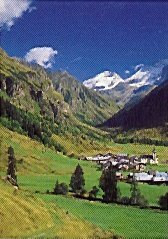 Go to the isolated but discretely visible mountain-meeting places of the ibex, chamois, marmottes . 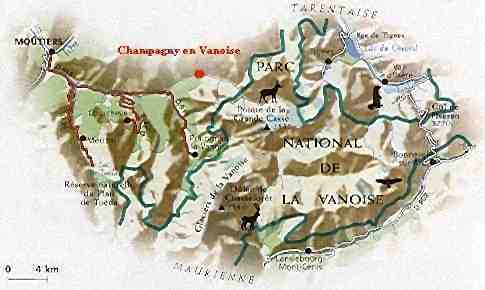 Champagny le Haut is a privileged gateway to the Vanoise National Park, the hiker's paradise. Nature unfolds in front of you the original beauty (53000 h. of protected nature between the Maurienne and Tarentaise vallies. There are more than 500 kms of signposted footpaths, which criss-cross forests, lakes, alpine countryside and summits. Each summer, many activities are organized to discover the Vanoise national Park : meeting, slide show with a Park Ranger, hikes with a Park Ranger or with a mountain guide. At "Le Bois" in Champagny le Haut free film or slide show on Mondays and nature animation at the discovery footpath on Tuesdays . Champagny-le-Haut - at 1,500 m., is a conservation area, and noted for its traditional village but also for its distinctive geography and landscape. The interpretation tables show footpaths to explore, explain the typical Alpine mountain characteristics, and the magnificent summits surrounding this fantastic valley. At the entrance of the village, "Le Torchet" there is a schist rock which is relatively easy to climb. At Champagny le Haut, there is a new rock climbing area !!!!!!!!!!! under the via ferrata and also a new rock climbing area at La Ravière. climbing routes, equipped with safety features, combining the thrill of climbing to breathtakingly high heights with fabulous panoramic views of Champagny le Haut. Around Champagny many trails are marked. At the top of the cable-car, you can explore and ride down the mountain as far as Champagny la Bas or follow another trail and discover the "Mont Jovet". New mountain biking routes for all levels. At "Le Bois", behind the campsite, find a fun aerial forest adventure trail with a wide range of varied building workshops: Tyrolean slide, aerial bridge, footbridge. Note: minimum height restriction : 1m 40.
which benefits from being situated in the heart of this exceptional mountain village of Champagny en Vanoise, and caters for young to older people, in fact all age groups.